Nikon Coolpix 8700 Manual is aimed to fulfill the needs toward information of both technical or instrumental issue among this digital camera product especially for Nikon Coolpix 8700. Nikon Coolpix 8700 is an 8-megapixel sensor, an 8x zoom lens with ED glass. It is poised to compete at the very top of the “prosumer” digital camera market. At the same time though, optional fully automatic operation and a rich collection of 12 “scene” modes make it easy for even rank amateurs to use. The new Nikon Coolpix 8700 is a powerful package of photographic technology. When Nikon Coolpix 8700 was firstly released to the market? How much the price when Nikon Coolpix 8700 firstly released? Nikon Coolpix 8700 is a digital camera manufactured and distributed by Nikon. It features 8.0 megapixels (effective), and a 8x optical/4x digital zoom. It was announced by Nikon on January 28, 2004. 8.0-megapixel CCD delivering image resolutions as high as 3,264 x 2,448 pixels. 8x, 8.9-71.2mm Nikkor ED lens with 35-280mm zoom equivalent focal length range. Electronic viewfinder with information display. As high as 4x digital zoom. 1.8-inch color LCD monitor with swivel design. Automatic and manual focus control, with adjustable focus area. Maximum aperture of f/2.8-4.2 depending on zoom setting. Available shutter speeds from 1/4,000-second to eight seconds, ten minutes in Bulb mode (up from the 5700’s five minutes). Program AE, Flexible Program AE, Aperture Priority, Shutter Priority, and Manual exposure modes. 256-segment Matrix, Center-Weighted, Spot, and AF Spot metering modes. Seven White Balance modes with a White Balance Bracketing mode. Auto sensitivity or ISO equivalents of 50, 100, 200, and 400 (5700 offered up to 800, but did not offer 50). Image Adjustment menu, Sharpness, Saturation, and Noise Reduction controls. Continuous, High Speed Continuous, Ultra High Speed Continuous, Multi-Shot 16, Best Shot Selector, and Movie (with sound) shooting modes. “Best Shot Selector” or BSS, captures multiple images (up to 10) in low light where the image is likely to be blurred; the camera then selects the sharpest and saves it to the card. “Exposure BSS” takes up to five shots and selects the best for shadow and highlight detail. Built-in, pop-up flash with five settings. Images and movies stored to CompactFlash Type I or II memory cards, plus MicroDrive. Uncompressed TIFF, NEF (RAW data), JPEG, and QuickTime and WAV file formats. USB cable and interface for quick connection to a PC or Macintosh. Power supplied by rechargeable lithium-ion battery pack (included) or optional AC adapter. NTSC or PAL video outputs with appropriate cable included. Digital Print Order Format (DPOF) compatibility. In the first release, The Nikon Coolpix 8700 pricing set at about $799.00 body-only. Now, if you’re interested to own this compact digital camera device, you can get it in several online stores by paying $115.00 for Nikon Coolpix 8700 8MP Digital Camera with 8x Optical Zoom of the used products. 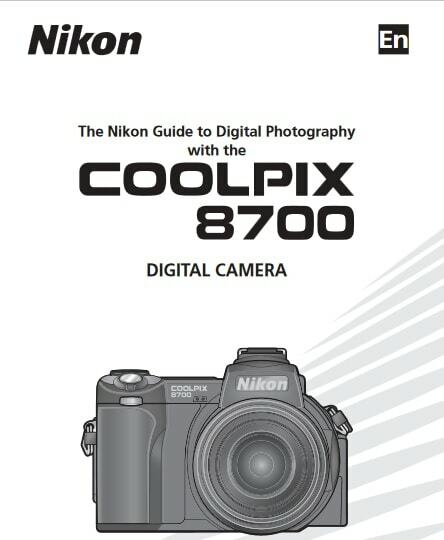 Feel free to download the nikon coolpix 8700 manual user guide at below.